Just in time for Halloween! 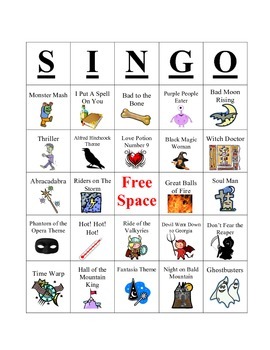 This game combines Name That Tune & BINGO in one fun musical experience your students will love. 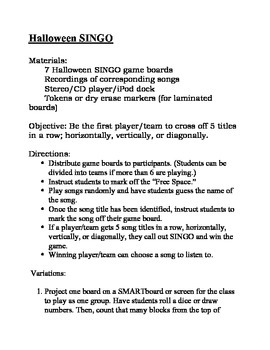 This kit contains 7 game boards, directions, and master song list. **Note- music and song recordings are not included in this kit. 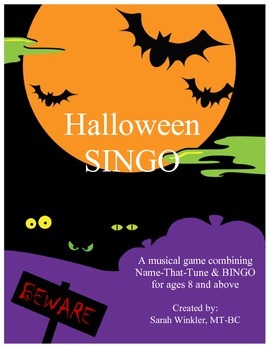 The songs listed are easily found on iTunes or Halloween-themed CDs sold at retail stores nationwide. Perfect game to work on auditory discrimination, reading, counting, and spacial awareness. Kid tested, staff approved!